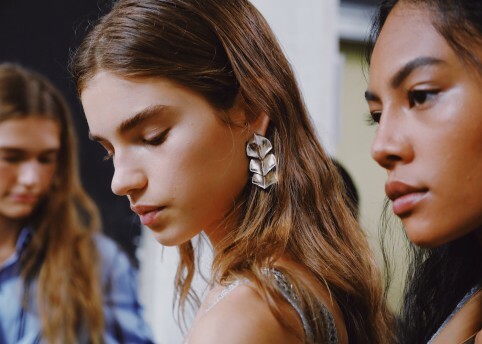 Like Bob Dylan’s Like a Rolling Stone, Hedi Slimane’s tenure at Celine started with the crack of a drum: the continuation of a beat he’s been riding throughout his oeuvre. Here, a Garde Republicaine drummer wearing traditional uniform set the night in motion – the crack of the snare drum being the starting piston on a new chapter set to reverberate from Madison Avenue to Avenue Montaigne. After all, few things are as visceral as a piercing drum beat. But Hedi Slimane’s output is a worthy rival. Lest we forget, at Dior Homme he defined modern menswear, ushering in a new masculinity embodied by his young, slim-hipped and androgynous musician and street-cast models, while his tenure at the helm of Saint Laurent saw him reposition the house to become one of luxury fashion’s superpowers, driven by youth, music and the designer’s immersion in LA’s burgeoning arts scene. 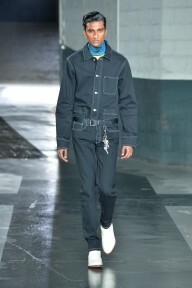 Throughout it all, Hedi has carved a universe populated by a cult-like following – we’re talking Beatlemania-style, kids climbing over walls to get a glimpse of the action – via a totally authentic and uncompromising ethos, attitude and style. As for clues to Hedi’s Celine: on his appointment we learned he was set to introduce the Celine man via the house’s inaugural menswear line; in the months leading up to the show we were hit with a series of monochrome images shot by Hedi and establishing his new muses; and then came a logo change. What was Céline is now Celine. Dummies were spat, facts ignored and history repeated: as with when Hedi dropped the ‘Yves’ at Saint Laurent – a highly respectful nod to Mr Yves Saint Laurent, who named his game-changing 1966 ready-to-wear collection ‘Saint Laurent Rive Gauche’ – the Celine logo change reverted back to the house’s original logo debuted back in the 60s (sans accent aigu), before Philo introduced the accent during her tenure. Back to the day of Hedi’s debut collection for Celine, and guests entered a specially-constructed show space at Les Invalides for the show, titled Paris La Nuit. Inside was a kaleidoscopic set concept designed by Hedi and based on the idea of a wind-up ballerina in a music box – bringing those French guard drummers mentioned earlier into new context. Here was a homage to Celine’s heritage: founded in Paris by Céline Vipiana in 1945, the brand was originally conceived as a made-to-measure children’s shoe boutique. Like Dylan’s aforementioned 1965 track, Hedi’s drum beat took things electric. 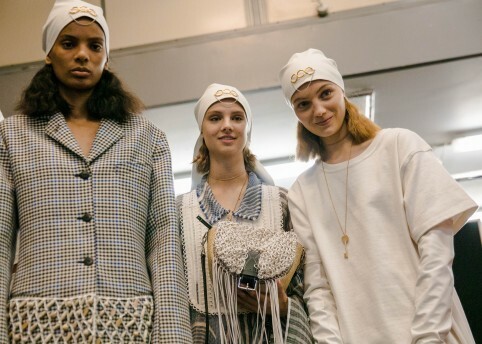 The mirrored set shapeshifted and glistened to the beat of an original track – Runway – by Parisian synth psych band La Femme and from behind the hot lights emerged our first introduction to this new Celine gang. Referencing the French ‘cold wave’ music scene in the show notes, here that crowd spilled onto the catwalk. Like characters from a Jean-Pierre Melville movie, guys strutted with purpose in impeccably tailored, Jeunes Gens Modernes-inspired monochrome suiting (cut to the bone, of course, and occasionally rendered in leather). 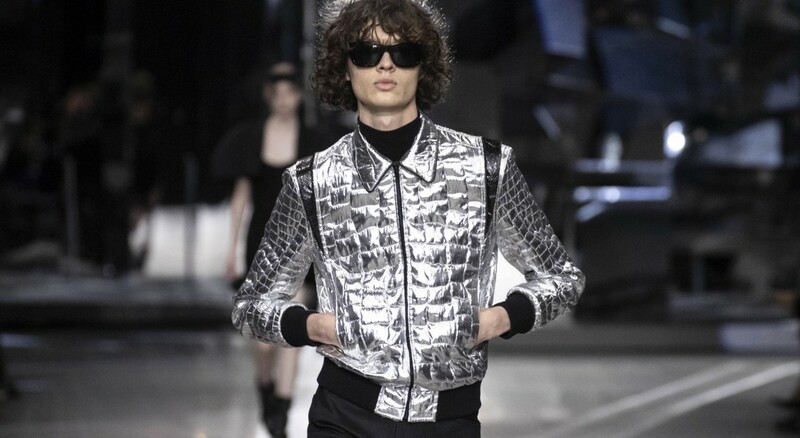 Slim Parisian trenchcoats, pointed black 40mm heel boots and those quintessentially Hedi leather perfecto jackets that fit like no other also filtered into the mix, while silver bomber jackets, sequinned blazers and a series of metallic pieces all hinted at glam. Everything was finished with thick Lou Reed-esque black shades. 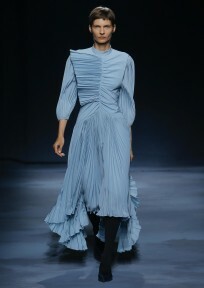 And we should point out, all the menswear looks were unisex and will also be made available for women, further cementing Hedi’s commitment to androgyny that began with his initial Dior Homme campaign image featuring Dutch female model Saskia de Brauw – spotlighting a menswear collection that was also made available for women (a very big deal at that time). 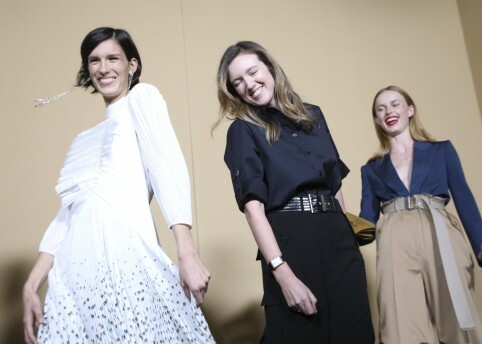 In complete harmony with their male counterparts, Hedi’s Celine girl was plucked from the back booth of a Parisian haunt. The Elli to the guys’ Jacno, she switched between masculine suiting (sometimes paired with Parisian Bibi hats – a tribute to Hedi’s misspent youth at the Palace and the Bains Douche), A-line shifts, puffball skirts and short cocktail versions that shimmered like the Eiffel Tower on the hour. While ‘Dancing Dresses’ were designed with hanging skirts and draped metal beads – designed to be worn under coats or men’s jackets and later let loose on the dancefloor. In a show heavy on the black, we also got a collaboration with Swiss-American artist Christian Marclay (his work, The Clock, is a current must-see at Tate Modern), whose paintings and comic book collages were translated as prints across bags, patches on jackets, and fully transformed into hand-embroidered couture dresses. On the front row sat Slimane-approved musicians – a line-up to rival any festival booker: from stalwarts Carl Barat, Bobby Gillespie, Lady Gaga, Daft Punk, Jamie Hince and Ian Svenonius to nascent talent endorsed by the designer such as Juniore, Lescop, Papooz and Oracle Sisters. And as the French guard drummers brought proceedings to a close, the beating heart of Hedi’s Celine reset had begun to race.